Sierra offers a wide range of time and attendance hardware devices, all considered best of class. From simple in-out time clocks to sophisticated biometric devices, web based options and even a mobile application. 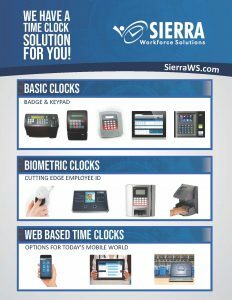 Sierra works to only offer time and attendance hardware options that are tried and true and a great value for our clients. These time clocks can all be integrated with your time and attendance system for real time data pushes. By automating your time and attendance data collection process, you can eliminate the manpower and mistakes associated with conventional time cards; reducing payroll costs, eliminating entry errors, providing job site access control and stopping buddy punching. 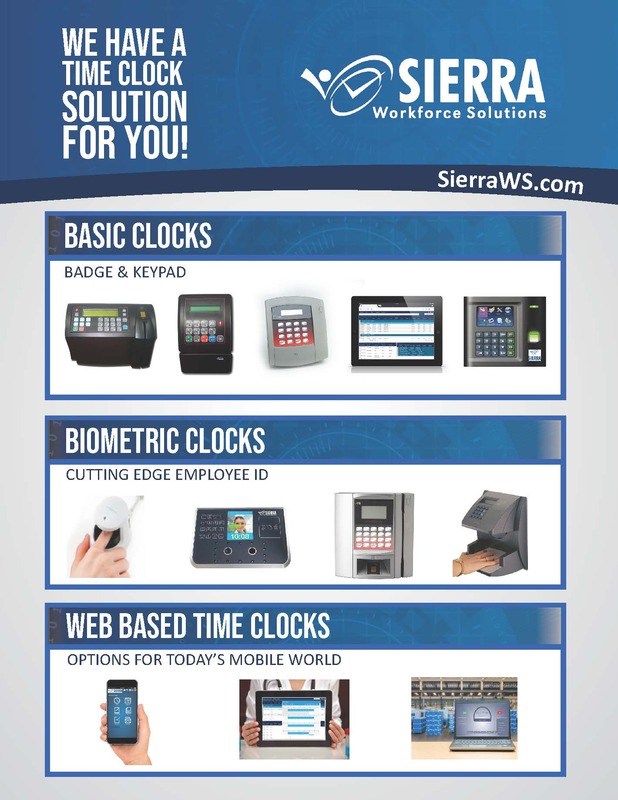 Sierra Workforce Solutions has an array of time clock options for you! Our top notch assortment of time clocks integrates seamlessly with our time & attendance software solutions. We have solutions for all budgets and work environments-on premises and SaaS. Click to the left to start exploring Sierra’s line of time clocks! Start making time work for you today. Take a look-we carry everything from traditional time clocks, enterprise based-kiosks, individual work station, assorted biometric options and even mobile apps!